The Rifts® Secrets of the Atlanteans™ “Gold Edition” Hardcover (only 300 signed and numbered copies) should arrive this afternoon or Friday, and start shipping sometime next week (we need time for all of us to sign and number 300 copies). Meanwhile, Rifts® Secrets of the Atlanteans™ and Nightbane® Dark Designs™ continue to fly off the shelves, along with many other Rifts® titles, and we are seeing a sudden run on issues of The Rifter®. Actually, everything seems to be selling at the moment, with an emphasis on Rifts®, Robotech®, Palladium Fantasy®, Heroes Unlimited™, Nightbane®, and Dead Reign® (Zombie Apocalypse). Very nice to see. Meanwhile, 20+ Palladium creators have notified me that they will be at the 2018 Palladium Open House. See the POH update for the full list and new details. Last weekend was the Alliance Trade Show. Wayne and I were in attendance to chat with retailers and industry people. It was nice seeing some old friends like Herb Barents, one of Palladium’s first distributors in 1981, Bob Carty (we first met in 1985), John Zinser (AEG) and Aldo, among others, including many retailers we see at the annual Alliance event. We also chatted with members of the Alliance distribution team and contributed to the charity auction in memory of beloved Phyllis Opolko. Of course, the highlight is always talking with new retailers, getting their input and introducing people to the Palladium game lines. We left feeling positive and energized. There were a few fun surprises. A big, fun surprise was seeing some of my earliest artwork prominently featured on the cover of Goodman Games’ Judges Guild Deluxe Collector’s Edition, Vol. One. It is a collage of artwork with one of my illustrations in the upper lefthand corner, one in the lower left corner, and another on the back cover. Talk about a blast from the past. For those of you who don’t know about this mover and shaker in the early days of D&D, Judges Guild was the official publisher of Dungeons and Dragons sourcebooks and supplements in the late 1970s and early 1980s. I have no idea how the owner, Bob Bledsaw, cut that deal, but he published a ton of stuff for D&D. Some of it was great, and Judges Guild was the original publisher of Dungeon Magazine as well as being one of my very first freelance art jobs waaaaaaaaaaaaay back in 1979. Before I started Palladium Books in 1981, I was supporting myself doing work as a freelance artist, with aspirations of (and some luck at) becoming a comic book artist and writer. I did something like 360 illustrations in the short five months I was freelancing for Judges Guild. I quickly rose to being one of their top paid artists (which was not much), along with a talented gent by the name of Paul Jacquois. The low pay and sweatshop approach to its artists prompted me to leave the company in short order. 72 illustrations a month was a murderous pace. I think only my experience in comic books and speed as a comic book penciller and inker enabled me to keep up that pace as long as I did. However, many of my illustrations would be reprinted dozens of times by Judges Guild over the next several years, helping to giving me a name and solid reputation as an artist in the early days of the RPG industry. Crazy, right? It was a valuable experience and Bob gave me a ton of freedom doing artwork, so I had fun doing a lot of it, even if some of it was quite rushed and simplified. I experimented and learned a lot from that job, and made a lasting friend in Paul. In a way, Bob helped inspire me to start Palladium Books. I saw how successful he was, and he was the only company of the day that offered to buy my RPG game system. 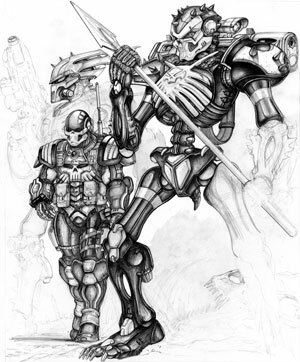 His offer was unacceptable to me, but the fact that Bob wanted to buy it, and then hired me as an artist and threw so much work at me, helped build my confidence to start Palladium Books 18 months later. I think Rifts® Secrets of the Atlanteans™ is on the fast track to becoming one of our hottest selling Rifts® titles ever! But who doesn’t love True Atlanteans, Undead Slayers and the Sunaj? And I’m thrilled to report that author Carl Gleba will be one of the creators at the 2018 Palladium Open House! Get him to sign the many books he has written for Palladium, and try to get a chance to play in one of his games, because Carl is an outstanding Game Master! Please keep those orders coming. 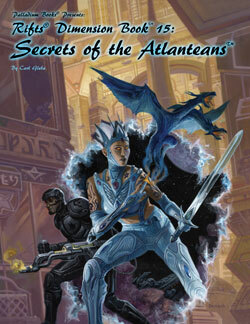 Atlanteans is just one of several new Rifts® titles coming soon, each with many more secrets to be revealed. Take a look at the free preview on DriveThruRPG.com to get a glimpse of everything this 224 page, resource-packed book has to offer. $24.95 retail. And if you don’t already own them, we highly recommend you pick up Rifts® World Book One: Atlantis, World Book 21: Splynn Dimensional Market™, and Rifts® Dimension Book 7: Megaverse® Builder (also written by Carl Gleba). 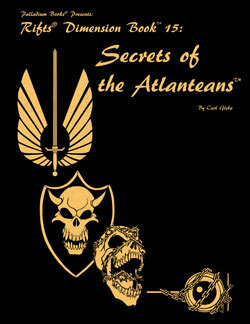 All are fun and useful companions to Rifts® Secrets of the Atlanteans™. 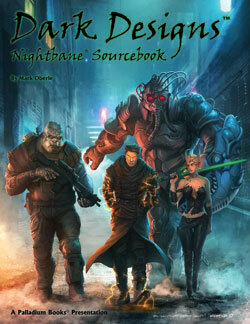 Nightbane® Dark Designs™, like Rifts® Secrets of the Atlanteans, is flying off the shelves. And it should. It is a dynamic sourcebook packed with information, Morphus tables, magical Talents (plus tables and Talents from prior books), the Ancient Nightbane and more. Remember, Talents and Morphus abilities can be easily turned into magic spells and super abilities for other world settings — and vice versa, made especially easy with the conversion rules in Dark Designs™. You can get author Mark Oberle to sign your book (and other titles) at the 2018 Palladium Open House. Mark has confirmed he’ll be one of the many Palladium creators at the POH. Please take a look at the free preview on DriveThruRPG.com for more details and a few choice glimpses of what you can expect. Also see the full description of Dark Designs™ elsewhere in this Update and in the online store. We expect the limited Gold Edition Rifts® Secrets of the Atlanteans™ hardcover to arrive at the Palladium warehouse later today (I’m writing this Thursday morning) or tomorrow. It will take us a few days to sign and number the 300 copy limited edition. The Atlanteans Gold Edition is limited to only 300 signed and numbered copies, and sold on a first come, first served basis. Remember, Palladium’s Gold Editions have a history of increasing in value over time, and with Christmas coming and how hot the soft-cover edition is, I think the Gold Edition may be a hot commodity in the months ahead. If you are planning on getting one, I’d suggest getting it sooner rather than later. 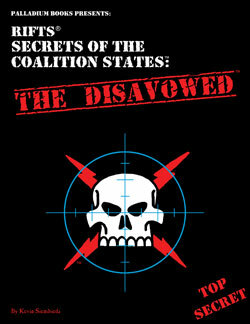 Only available from Palladium Books. This week Wayne was able to make significant progress on The Rifter® #78, and Chuck Walton has been pounding away on his art contribution to the issue. We hope to enter into final layout and send it off to the printer by the end of next week. This is another great issue with a range of awesome source material for Palladium Fantasy®, Rifts®, Splicers®, and Beyond the Supernatural™, including Greg Diaczyk’s BTS Modern Necromancer, plus G.M. advice, news and other goodness. ALL of it adaptable to just about ANY game setting. See the full description below. 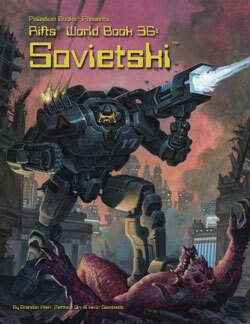 Assigning out the final artwork for Rifts® Sovietski and going into final production soon. Looking great. Instructions: A) When reserving a room at Red Roof Inn, be sure to request the “Palladium Books Group Rate.” At the Hampton Inn & Suites, you need the following 3-letter code: POH (Group Rate). B) Make certain you request two beds if that is what you need. Otherwise you are likely to get one queen- or king-size bed. Important Note: Doubles (rooms with two beds) are limited at BOTH hotels! Order sooner than later. C) Reserve your room now. Your card will NOT be charged until the date of the event, and you make sure you have your room held for you. HOTEL CANCELLATIONS: To avoid “cancellation fees” we recommend you cancel at least 3 days before the event (or as soon as you know you cannot make the POH). Note: Must RESERVE HOTEL ROOM by March 15, 2017 to guarantee a room and get the special Group Rates. Want to stay a few extra days? The Red Roof Inn said they would extend the special rate of $49.95 to include one or more extra days for those of you who may be arriving a day or two early or staying a day after (Monday, April 23, checking out on Tuesday morning). POH Dates – April 19 for VIP Thursday. April 20-22, 2018 (Friday, Saturday and Sunday). The Hampton Inn was not willing to extend this courtesy, though if enough people inquire, they might. It cannot hurt to ask. Note: The Red Roof Inn is a no frills hotel, hence the low nightly rate, in a nice, safe neighborhood right off the highway. Make sure you tell the hotel you want the “Palladium Books Group Rate” and request two double beds if that’s what you need. Located in Plymouth. Location: It is only 3 miles away from the Palladium warehouse and near where the old hotel is located, off of Ann Arbor Road and I-275. Many places to eat nearby on Ann Arbor Road. We highly recommend a small family diner, Good Day Café restaurant on Hix Road (and half-way to Palladium) for a quick, tasty and inexpensive breakfast. Kathy and Kevin enjoy breakfast there often. Request the “POH” Group Rate. $129 per night for one “King Suite” – SUITE is the important part of this request – and it comes with one king bed and a pull out sofa, but PLEASE confirm that with the hotel. This is a more upscale hotel also in a nice part of town near Palladium Books. Free hot breakfast offered daily, allowing guests to start their day off right without an additional charge. Free high-speed and Wireless Internet access in the lobby and all guestrooms, allowing guests to stay connected to their friends and family while at the hotel. Location: City of Canton. Most notable cross streets: Ford Road and I-275. Only 2 miles (3.2 km) away from the Palladium warehouse and near all kinds of places to eat down Ford Road, and an Ikea. Play in games run by the very people who make them, in the building where the magic happens. At the Palladium warehouse in Westland, Michigan. 30-40 Palladium creators will be present to chat and sign books. 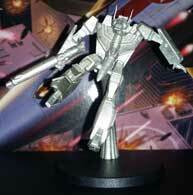 Saturday Auction (evening) of Palladium Books collectibles, original art, out of print items and oddities. Get the latest news and happenings. Spend time and play in games with Kevin Siembieda and other Palladium personalities. New on DriveThruRPG.com – Rifts® Dimension Book™ 5: Anvil Galaxy™ – plus Sneak Previews, 50+ Rifts® titles, Robotech® and much more. 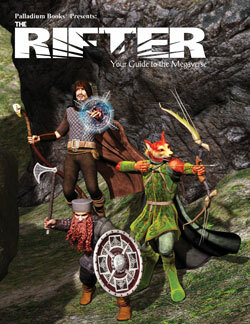 Rifts® Dimension Book™ 5: Anvil Galaxy™ – nearly 20 new alien races as optional player characters, notable worlds, legends of the Cosmic Forge, Cosmo-Knights, the TGE, the CCW, planet creation rules, and more – is new this week. It joins recent releases of the ever popular Rifts® Dimension Books: Wormwood™, Phase World®, Phase World® Sourcebook, and Skraypers™, as well as Ninjas & Superspies™ and Mystic China™. 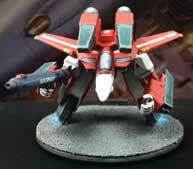 Next week will see the addition of Rifts® DB 6: Three Galaxies™, followed by other Dimension Books and game titles. 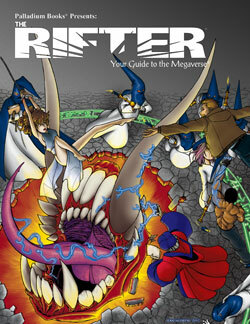 These are just some of the many Rifts® and other PDF titles now available on DriveThruRPG.com. Heroes Unlimited™ RPG first edition rule book and sourcebooks. Some 2nd edition sourcebooks with more coming. Create any type of superhuman. Palladium has been on a roll. We’ve got a lot of exciting product in the pipeline and big plans for everything from Rifts® and Robotech® to Heroes Unlimited™, Palladium Fantasy® and everything else. We’re feeling positive and our creative juices are flowing. That’s great, but in the back of our minds we are thinking about and worried for our fans, friends and family in areas recently hit by natural disasters. It’s kind of weird writing about such things in a game context like Taylor White and I did in Hell Followed, and then seeing the devastation played out in real life. We have friends and fans in the Houston area; fans, friends and family in Florida; and fans in Mexico, the Carribean and around the world. Our hearts go out to everyone struck by such frightening events and possible misfortune. Many of us in the Palladium family, particularly Alex and I know, firsthand, what it is like to lose treasured family photographs, books, possessions and home through unforeseen tragedy. Please try to power through this and focus on the positive and rebuilding. It will be difficult, but try to stay hopeful and positive. Remember that you are loved. Know that things will get better. Remember too, that possessions, no matter how treasured, are just “stuff.” It is the people and loved ones in our lives, and the memories locked safely in our heads and held with joy in our hearts, that truly matter. I encourage those of you who can, to contribute to organizations like the American Red Cross who are out there, front and center, helping those in need, and to do whatever you reasonably can for those in distress. It doesn’t need to be money. It can be a kind and comforting word to a fellow gamer, and any number of small kindnesses. A simple, kind word or a bit of your time to listen to a friend can mean the world to that person. We can all make a difference if we choose to make those small – more meaningful than you know – gestures. And while you are at it, you might want to call a loved one to let them know how much they mean to you and dish out hugs and smiles to the people who matter to you. Take care, be safe and know that every Palladium fan means the world to us. Another issue of source material for four or more Palladium game settings, most of which can be adapted to any game world. This issue has a nice hunk of material about the supernatural, such as the Modern Necromancer by Greg Diaczyk, a Beyond the Supernatural™ monster by Kevin Siembieda, City of Khemennu: Part Two (Palladium Fantasy) which is a city of gods and churches by Ian Herbert, plus G.M. Advice and the Splicers® Legion Aftermath. Shaping up to be another great issue. One or two final articles to be selected. Artwork is being assigned. $50.00 retail – 224 pages – written by Carl Gleba – Cat. No. 890HC – At the printer, mid-September release.